God made the vulture. Vultures are classified as birds of prey, but they usually eat carrion (animals that are already dead). Vultures are very important animals because they are like garbage disposals. They eat stinking, rotten meat that can spread all kinds of diseases. God gave the vulture a very tough digestive tract. Doctors are studying why vultures are so resistant to bacteria, viruses and diseases. If they can figure out why vultures stay healthy, they can help people to overcome sickness. Vultures are very interesting animals. Did you know that some vultures only eat bones? They can swallow a bone as big as a baseball bat. Sometimes the bone is so long that it sticks out of their mouths after they swallow it. The vulture then has to wait until its powerful digestive fluids can process the bone. 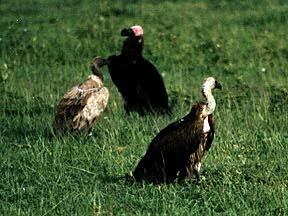 Some vultures even eat animal and human wastes. Some vultures find food by their sense of smell, others find carrion by sight--they soar high in the sky and look for food or for other vultures who are already eating so that they can go join them. Vultures have large, powerful wings that they use to soar through the sky. Vultures don't lay many eggs. Some nest in rocks and cliffs while others prefer trees. If two baby vultures are born, sometimes the bigger one will kill the younger one if there is not enough food. Vultures live all over the world--from America to Turkey to Greece to Egypt, and even other places. They come in many different sizes and colors and live in environments ranging from semi-arid (almost like a desert), to forests, to grasslands. 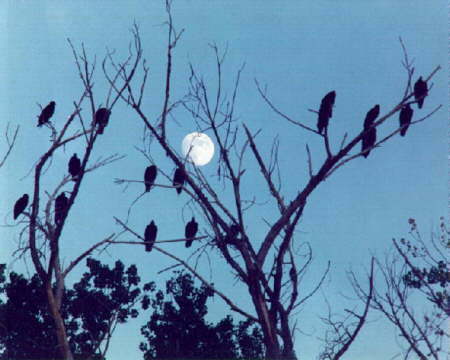 Click here for a picture of a group of vultures roosting for the night. God gave us the vulture.